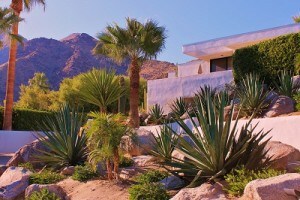 The Movie Colony in Palm Springs, CA. The Movie Colony is located in the heart of Palm Springs, just across Palm Canyon Drive from the historic Old Las Palmas neighborhood. Its name aptly describes this eclectic array of cottages, bungalows and estates which were built and inhabited by some of old Hollywood’s stars and celebrities such as Cary Grant, Dinah Shore, Jack Benny, Marilyn Monroe and more. The Movie Colony is within walking distance of downtown Palm Springs and all that it offers, such as fine dining, galleries, boutique shops, live entertainment, the Palm Springs Art Museum and much more. The neighborhood is made up of approximately 182 residential properties including 2 condo developments, six hotels, 3 medical plazas, an elementary school and two parks. Ruth Hardy Park has tennis courts, play areas, basketball court, volleyball courts, picnic tables with barbecues and large open fields. The Wellness Park, located across from the Desert Regional Medical Center, offers a quarter mile jogging loop, exercise/fitness stations, and four themed gardens – meditation, healing, fragrance and memorial gardens. How wonderful having these amenities within the borders of your own historic neighborhood !!! The Movie Colony is only 3 miles away from the Palm Springs International Airport and Interstate 10 can be accessed in 15 minutes via several different routes. The Movie Colony’s approx. 170 homes, are comprised of an eclectic mix of 1920’s and 30’s Spanish style estates, Mid-Century Modern, and California Ranch style architecture. Driving through the tree-lined streets of this lovely neighborhood, you can see that most of the residences are concealed from view by gated walls and hedges. Privacy was a big priority for the celebrities who originally lived here. To accommodate their Hollywood lifestyles of frequent entertaining, these properties often feature private casitas or guest homes and some of them have as many as six spacious bedrooms, all complete with baths. There are no HOA’s for The Movie Colony. Instead there exists the Movie Colony Neighborhood Organization, dedicated to preserving the beauty and history of this iconic community and protecting the security of its members. Location: The recognized boundaries of this neighborhood are Tachevah Rd. on the North,Alejo Rd. on the South, Avenida Caballeros on the East and Indian Canyon on the West in Palm Springs. People who like The Movie Colony also tend to enjoy Ruth Hardy Park, Old Las Palmas and Vista Las Palmas.